Building upon the basic idea of hegemonic contestation discussed in my last post, I want to now move into an exploration of the mechanics of this process. Specifically I want to examine a structural pattern found in hegemonic alignments — and, even more specifically, in hegemonic alignments that can also be described as populist. A hegemonic alignment is an aligning, however temporary or ephemeral, of different social groups, blocs, identities, aggregations, organizations, etc. into a tenuously unified force that intervenes in social reality (enters a hegemonic contest). The alignment, because of its broad social bases and combined capacity, can pack a much more powerful punch than any of its component parts could on their own. Such an alignment is not necessarily clearly defined, delineated or formally coordinated — usually it is none of these things. In addition to the alignment’s engaging in a hegemonic contest in relation to the remainder of society (i.e. groups outside of the alignment, both opposition and “neutrals”), typically some particular group also exercises a form of hegemony (i.e. predominance, leadership) within the alignment itself. 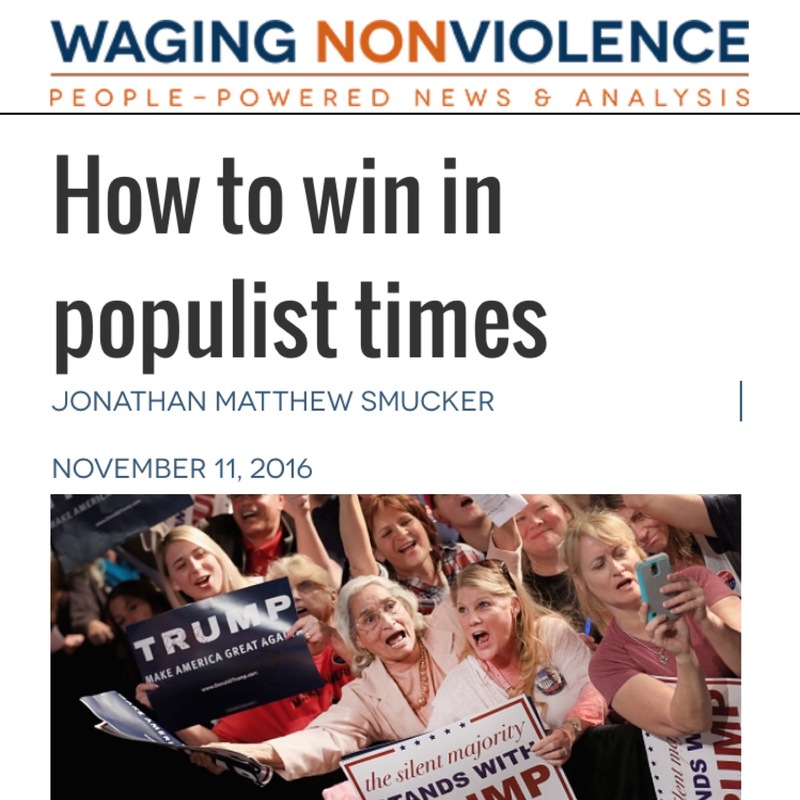 A populist alignment is a hegemonic alignment that is framed as a challenger/underdog force or movement. Its raison d’etre is to challenge some formidable power, whether it be an oppressive government, corporation, policy, or status quo social system. In other words, elite interests can and do align into hegemonic alignments, but these do not constitute populist alignments. A faux-populist alignment is a hegemonic alignment dominated by elite interests that styles itself as populist. It accomplishes this most effectively by charming genuinely disenfranchised groups (e.g. poor white people in rural areas) into the alignment. Fascism is the quintessential example of a faux-populist alignment. The so-called “Tea Party” is another example. The use of faux- is admittedly something of a value judgment; both faux-populist alignments and genuine populist alignments have to engage the same mechanics of hegemonic contestation. I believe that hegemonic populist alignments are “the only game in town” if we want to accomplish big social, economic and political changes. The powers we are up against—especially when it comes to Wall Street, corporate power, and capitalism—are so entrenched, have so consolidated their control of the economic and political spheres, we have no option except to organize a truly broad-based counter-force. This is a very difficult thing to do, given that we live in a society whose identities are highly fragmented and heterogeneous — a reality that is also true for the identities within the broadly conceived US Left. Marx was mistaken in his prediction that conditions of industrialization would lead to a more homogenized, self-aware industrial working class. What actually happened was that capitalist processes made industrialized societies increasingly complex in their identity aggregations (i.e. less homogenous). “Workers of the world” have not organically and automatically attained the level of group identity, consciousness and class unity that Marx and many Marxists had anticipated. For them the problem of mobilizing society for its own transformation would be resolved, eventually, through a structurally determined, almost automatic, unfolding of history. The hegemonic historical actor — the proletariat — would emerge through objective conditions and would hardly need to be intentionally constructed. Our societies are far less homogenous than those in which the Marxian models were formulated, and the constitution of the collective wills takes place in terrains crossed by far more complex relations of power — as a result, inter alia, of the development of mass media. Sociological trends in the past hundred years have pushed people in industrialized societies to disperse their individual identities across many groups/aggregations (e.g. workplace, religious community, family, neighborhood, hobby, etc.). Those aggregations develop their own particular purposes, deepen their particular cultures, and encourage within-group bonding. Within-group bonding is accomplished in large part by creating distinctions between the group and other groups. Even groups that are remarkably similar to each other in worldview and purpose (e.g. two different labor unions) will engage in marginal differentiation, where their differences are emphasized and exaggerated. This is the backdrop of our heterogeneous society and fragmented political Left. Ron Inglehart’s explanation for the trend is based on Abraham Maslow’s “hierarchy of needs”: once our basic survival and material needs are provided for, we then focus more attention on social networks and individual expression. This explains why dramatic outbursts of self-expressiveness hit every industrialized society in the world simultaneously in the late 1960s. According to Bill Bishop (in The Big Sort), a generation that “grew up in relative abundance” started to display “a politics of self-expression.” And apparently, self-expressive people prefer to express themselves in like-minded company. So what’s the big deal? I like my friends and I’m glad they share my values. It’s affirming. It makes me feel good. I can relax in like-minded company. What’s the problem? …[There’s] a political problem — political in the sense of collective power. My friends and I may be satisfying our identity needs when we talk politics at the bar—or when we share political posts on each other’s Facebook walls—but what are we accomplishing? What can we accomplish? What do we, as a small, self-selecting, self-segregating group of folks have the capacity to accomplish — if we’re not connecting with others? Our task is difficult. The bonding social incentives within groups disincentivize bridging that can connect beyond the boundaries of groups — bridging that is necessary to create alignments big enough to make a big difference. (Read more on bonding & bridging.) And even if you’re sufficiently oriented toward the task of bridging, catalyzing a broad alignment remains a monumental undertaking. Before digging into some of the patterns and structures common to this undertaking, I first want to discuss some of the common mistakes many social change agents make in the attempt. Building from scratch. While specific movement organizations can be built from scratch, mass movements themselves—and populist hegemonic alignments—will never grow fast enough. Initial rapid growth in the midst of an exciting moment (e.g. Occupy Wall Street) will plateau quickly with a one-at-a-time recruitment model (or worse, a fully self-selecting, elbow-your-way-in “recruitment” model). Moments become mass movements when core organizers and movement organizations successfully encourage and facilitate the politicization and activation of important pre-existing institutions and social blocs in society. Purism. This second mistake relates to the first, insofar as purism encourages the attempt to build everything from scratch — for fear of contamination by elements of the existing society. Purism is the curse of social movements. It relates to sectarianism and all sorts of paralysis. Purism thrives when social movement groups get too sucked into the self-expressive and identity-validating cravings of group members and lose site of their groups-as-vehicles to accomplish instrumental goals. Purism isn’t really a “mistake in trying for alignment” so much as purists are an obstacle to those who do try. Purism disincentivizes even trying. Because if you’re in it only for the life of the group itself—and its arguably narcissistic self-expression—instead of what the group actually achieves, then there is no reason or motivation to look outside of the group, to a world that can only contaminate. This fear of contamination can create a “my way or the highway” attitude toward alignment and a rigid protectionism around ideas that we should be aiming to spread. Legitimate wariness of co-option becomes exaggerated, over-generalized, and paralyzing. What is needed instead is a willingness—hopefully even an eagerness—to enter into alignments that are too big for us to be able to fully control, but that, if we’re smart, we can influence. Long lefty laundry lists. The idea here is that by naming every issue under the sun, you’ll attract all the diverse groups and communities that care about all those issues. What better way to forge a broad alignment than to name all the different issues that different people care about, right? Unfortunately, naming lots of issues explicitly tends to have the opposite effect: “…the more issues you name explicitly, the less your appeal tends to resonate with any of the constituencies you’re hoping to attract. The more we spell out how each issue is explicitly connected, the less it becomes about a particular issue (i.e. entry/identity point) that any particular person, group, or social bloc is concerned about.” [Long lefty laundry lists]. This last what-not-to-do offers hints about what may work. If it doesn’t work to explicitly spell out how all our issues and all the fragmented aggregations of heterogenous society are connected—if that only aligns the highly analytical and the fringe radicals, and doesn’t activate broader bases—what about linking these issues and aggregations non-explicitly/ambiguously? This is to suggest the indispensable role of floating signifiers in catalyzing broad alignment, which I will discuss (and illustrate!) in part 2. Pingback: Anatomy of populist hegemonic alignment (part 2) « Devoke the Apocalypse. Previous PostWhat is hegemonic struggle?